Bollywood CineTalk: UK Asian TV Rating Last Week! The special episode featuring Kushal Tandon’s exit and courtroom ‘Aap Ki Adalat’ action in ‘Bigg Boss 7′ did well Thursday night in the UK. According to exclusive data obtained, ‘Bigg Boss 7′ was watched by 85,800 viewers – peaking at 95,100 viewers between 21:00 and 22:00. 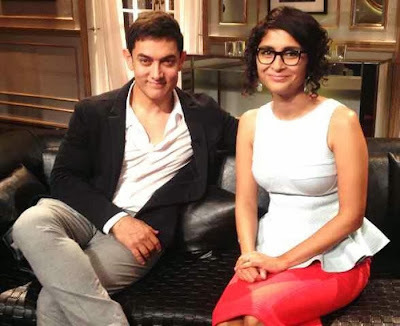 'Koffee With Karan' featuring Aamir Khan and his wife Kiran Rao, was the most watched show on UK Asian television over the last weekend. The episode, which aired yesterday at 19:00 pulled in 176,600 viewers – peaking at 211,700 viewers. ‘Nach Baliye 6′ Sunday night was in second place with 170,700 viewers (136,000 viewers on Saturday). ‘Arjun’ was next with 96,700 viewers on Sunday, while the Saturday episode pulled in 88,400 viewers. On Colors, ‘Comedy Nights With Kapil’ on Saturday night (repeat) pulled in 133,900 viewers, while the Sunday episode featuring Sania Mirza got 135,000 viewers. The exit of Armaan Kohli on ‘Bigg Boss 7′ on Saturday was watched by 108,400 viewers, while the Sunday episode with Salman Khan pulled in 137,600 viewers. On Rishtey, Pakistani drama ‘Mere Qatil Mere Dildar’ pulled in 53,800 viewers on Saturday, while another 59,100 viewers tuned in on Sunday.